In the early years popularity of Golf Pride grips grew steadily. Not only did the new rubber grip provide improved feel and durability, but also offered other helpful benefits. It was lighter in weight than traditional leather grips, absorbed shock more effectively, and provided a more positive, high-traction gripping surface. 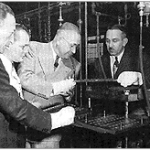 The big breakthrough came in 1953, with the introduction of the first “slip-on” grip. And while the technology seems simple today, it was a major development at the time. 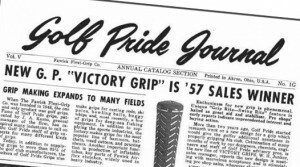 The impact of the slip-on grip on Golf Pride was significant and lasting, but it was no less profound on golf club manufacturers. Convenience of the new slip-on grip immediately changed the lead-time and economics in manufacturing golf clubs. It also made grip replacement a staple service in golf shops, as a quick and inexpensive way for golfers to update their equipment. By the mid-1950’s, a number of golf club manufacturers had switched to the slip-on grip, seeking the advantages of its convenience and economy, but Golf Pride was already a rising force in the world of golf. 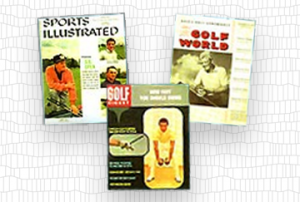 Golf Pride received a tremendous boost in 1958, when Tommy Bolt – who had been signed as a professional endorser along with Wally Ulrich and Chick Harbert – posted an impressive four-stroke Victory in the U.S. Open — the first win in a “major” by a player using the new slip-on grip. By the 1960’s, the slip-on rubber grip had proven itself at every level of usage, on the club assembly floor, in the club repair shop, at tour and other competitive golf events, and among golfers in general. Today, Golf Pride boasts 80 percent usage at virtually every level of major, professional, and amateur competition; and you’ll find grips made by Golf Pride on nearly every new club sold today. Simply put, Golf Pride is the number one grip in golf.